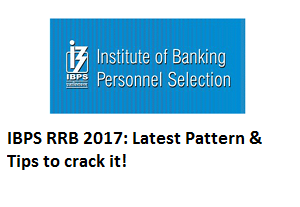 IBPS RRB 2017: Exam Pattern this time and How to crack it? IBPS has recently notified the advertisement for the posts of office assistant and officers in scale I, II and III in various regional rural banks of the country. The recruitment process for office assistants will be in two phases i.e. the preliminary examination and the main examination whereas for becoming an officer in the RRBs, you need to appear in the interview process as well after clearing the preliminary and mains examination. IBPS RRB 2017 Pattern: Are you ready for the challenge? IBPS has changed the process of recruitment for office assistants and officers in the various Regional Rural Banks in the country in last year. The process has been made more in line with the other banking recruitment examinations conducted in the country nowadays. • Prelims examination introduced: In the year 2016 IBPS has introduced the pattern of preliminary examination for the recruitment process in RRBs. Also, in this year the written examination will be conducted in two phases. For Office assistants and officers both, this examination will be conducted in order to filter candidates for the next phase i.e. the mains examination. • No interview for office assistants: Yes. You have read it right. There will be no interview for recruitment to the post of office assistants in these banks. Your selection will be completely based on your performance in the mains examination and allotment will be made on the basis of that only. • Only Reasoning and Maths in Prelims: Yes, no English in the prelims examination for both categories of posts. You have to face only reasoning and numerical ability questions in the prelims paper and on top of that, your marks will not be counted in the final merit list as this is only for the purpose of elimination. • Exam Pattern for prelims: The preliminary examination will consist of 80 questions from math and reasoning and you have to attempt the paper within 45 minutes. This is something new for banking aspirants since all the other prelims exams are generally of 100 marks and the test duration is generally of 1 hour. • Time Management remains your own forte: You have to think about the time management part in the examination since unlike IBPS PO and SBI PO, the sectional timing concept has not been introduced in this examination. This makes it possible for you to plan things accordingly as per your own convenience. • Reasoning and Quant have more weightage: In the mains examination, you are going to face 100 marks questions from the math and reasoning sections whereas the rest of the 100 marks are divided into English, Computer and General Awareness. The key to succeed remains your mastery over math and reasoning as it has always been. So, strengthen these two subjects if they are already not strong enough. • Practice as much as you can: Yes, the same thing again like any other thing. You need to be comfortable with the new pattern in order to succeed in it. The key to that is to practice as much as possible before the examination and be accustomed to the new pattern. This will give you that extra confidence in the examination hall. IBPS RRB jobs lack the growth trajectory that are there for the Public Sector Bank jobs since these banks are not well developed and mainly cater to a particular section of the society. The biggest advantage of working in a RRB is that you are certainly going to get home posting in case you are applying for a bank of your state. There is virtually no chance of your transfer to any other state or part of the country like for nationalized banks. Other than that, you are likely to get ample time to study as much as possible for your bigger dreams once you are in this job. These factors make it a very sought after jobs for the candidates. What is Islamic Banking & How does India benefit from it?